Chanting Nam Myoho Renge Kyo with these 8 helpful tips will bring us that much needed transformation which consequently enables us to achieve all our Goals & eventually be a Winner in Life! RELAX: Firstly, as you sit down to chant The Mystic Law, make all efforts to relax your mind and your heart, letting go of any anxieties, worries or negative energies! Also relax your physical body, by choosing to sit in a comfortable chair and in a comfortable pose (preferably sit upright always while chanting). This is when eventually, all three, your Mind, Body & Soul will feel completely ready for you to start chanting. KEEP YOUR EYES OPEN: When you chant Nam-Myoho-Renge-Kyo, you must always try and keep your eyes open. Why? Because this is the time you are looking into the mirror of your life and you know it best where it needs cleansing and polishing. Most importantly, you aim to have a beautiful and shining bright life! Even if you don’t have The Gohonzon, you can chant The Mystic Law by facing a blank wall. As you do this, try & concentrate by looking at a particular point on the wall, keeping your eyes open all throughout the chanting! This is not a rule, but a very good suggestion that I personally adhere to! THE GOHONZON: If you have the Gohonzon, then you do not need to face a blank wall (as mentioned in the point #2). Try and keep your eyes completely focused on the Gohonzon, preferably at the centre where it is easier to remain focused all throughout the chanting. The centre of The Gohonzon reads, ‘Nam Myoho Renge Kyo Nichiren’. At this time as you are chanting and talking to The Gohonzon, you will tend to figure out where your life needs some polishing and cleansing. In other words, this is the time to really figure out where & how in your own life you need to perform your own Human Revolution ! CHANTING ALONG WITH YOUR APP: Even more, open your Android App, TogetherWeChant (SGI Buddhism, Nam Myoho Renge Kyo). 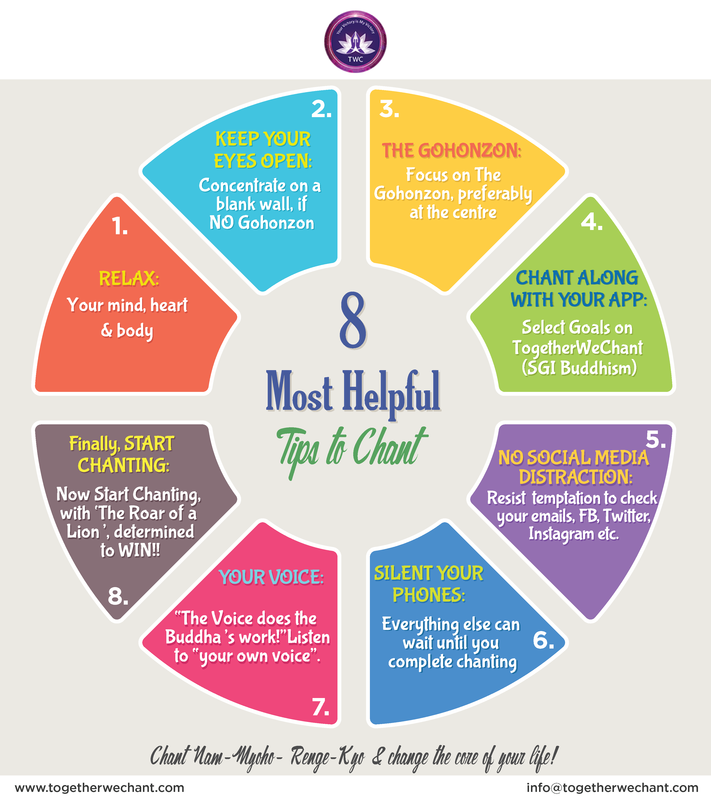 Select the Goals you would like to chant for, and get ready to start chanting for yourself and your friends worldwide. NO SOCIAL MEDIA: Above all, when sitting down to chant, resist the temptation to check your Whatsapp, emails, FB, Twitter, Instagram and other social media handles, on your phones, tablets, laptops etc. Just remain focused on your chanting as you are now engaging to transform YOUR OWN LIFE! YOUR VOICE: “The Voice does the Buddha’s work!” Hence as you chant, keep listening to “your own voice” as that will allow you to connect with your higher self and not let any unnecessary thoughts cross your mind while chanting Nam Myoho Renge Kyo. With your Android App as well, you can choose to put on the Audio and make it a group chanting, if you are chanting alone. It leads to a very sincere and powerful chanting when you do so! Go ahead, let’s hear you chant your heart out! FINALLY, START CHANTING: Now that you have selected your goals on the App, relaxed your mind-body-soul and decided to remain focused, finally, you may Start Chanting The Lotus Sutra, with ‘the roar of a lion’. Furthermore, Determine to Achieve all your Goals and really WIN!! This kind of focused Daimoku will certainly help you absolutely bring forth your Buddhahood & be a live example of the power of Nam Myoho Renge Kyo in a human life. Therefore, with these helpful tips to chant Nam-Myoho-Renge-Kyo, you will absolutely surely change the core of your life. You will definitely bring to yourself that which is in your highest & best interest and for your highest good & growth. Daimoku (chanting Nam Myoho Renge Kyo) in this manner comes from your core as you chant clearly, comfortably and confidently! The views expressed in this article are from my own experience of chanting The Lotus Sutra. So any similar information available online may just be a coincidence.